Block by block, I’m exploring Oakland. 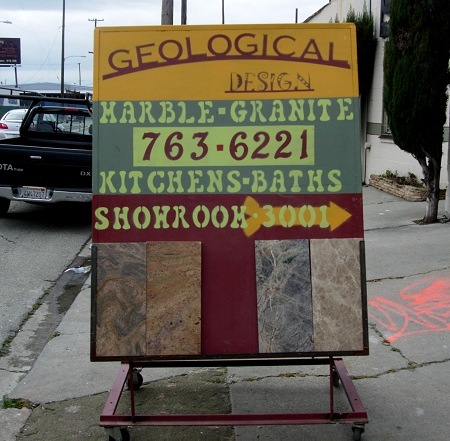 In West Oakland there isn’t much geology, but it has a thriving (or at least widespread) stone district. 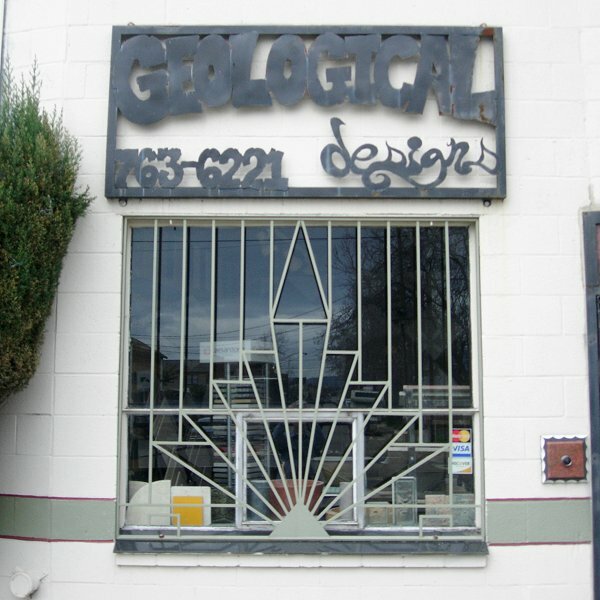 This small fabricator is on Peralta Street. This steel sign above the lovely window screen appears to say that the company name is actually “designs,” not “design.” So does Google. Stone, like concrete, brick and aggregate, is among the first things a new settlement demands. Like their wares, stone dealers seem to hang in there for the long term. I find them charming, but of course even stone has fads and trends and every other challenge a business experiences. The extra challenge of a stone business, I suppose, is gravity. Stone shops tend to cluster around heavy transport, and an old rail line runs past this address. Other stone yards occur in East Oakland near the tracks there. And another common site for very specialized stone businesses is near cemeteries. I often stopped and admired the monument shop on Piedmont Avenue just down from Mountain View Cemetery, a business that went back to the 1850s. This entry was posted on 19 February 2011 at 5:38 pm and is filed under Oakland stone. You can follow any responses to this entry through the RSS 2.0 feed. You can skip to the end and leave a response. Pinging is currently not allowed. These guys are down at Oakport Street now.